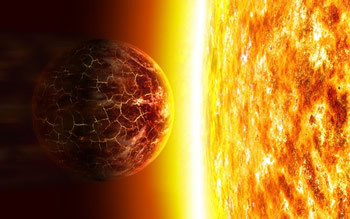 In approximately 4.5 billion years, the Sun will become a red giant and will destroy Earth. However, life on Earth will come to an end within the next billion years. According to the preliminary results of calculations based on the recently discovered Higgs boson particle, the universe will not live on indefinitely as previously believed. In fact, the Higgs boson suggests that the universe is inherently unstable. This will result in the total wipe out of the universe, albeit some billions of years in the future. 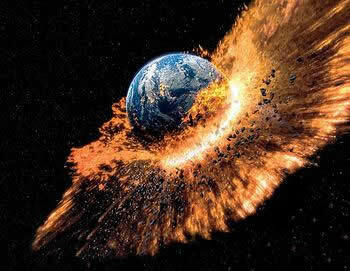 However, Earth will probably be destroyed long before the universe collapses. The Sun is expected to burn out in approximately 4.5 billion years, which will either destroy the Earth or leave it too hot to sustain life. The universe was born approximately 13.8 billion years ago from a singularity that contained the entire universe’s energy and matter in a single dense point. This singularity eventually exploded and the matter and energy started expanding at high speeds. This is what we called the Big Bang. This resulted in large amounts of gas and dust being spread out everywhere. The gas and dust were very hot at the time and were full of energy. Eventually, the dust started to combine into larger lumps. These lumps became so hot and dense that they started to generate their own energy, and started igniting nuclear fires. These were the beginnings of stars. One of these stars was the beginnings of our Sun. Eventually, the planets, moons and asteroids formed and fell into orbit around the Sun. The Sun, as a star, has to go through a certain set of life stages, starting from a nebula to a star, red giant, red dwarf, white dwarf, supernova, neutron stars, and eventually a black hole. Currently, the Sun is in the life stage of a star, and over the next 5 billion years, it will burn the last of its hydrogen and become a red giant. In doing so, it will expand to around 250 times its current size and eventually absorb Mercury, Venus and the Earth. However, life on Earth will have ended long before that. The Sun is slowly heating up. Over hundreds of millions of years, the amount of radiation pouring out of the Sun will grow. In a billion years, the amount of energy the Earth receives from the Sun will increase by about 10%. This will end up making the Earth’s surface hotter, so much so, that in fact the oceans will boil. All the water on the planet will evaporate, leaving the Earth dry and parched. The water vapor will rise into the atmosphere and as it is a powerful greenhouse gas, it will cause the temperature to grow even hotter. Then the plate tectonics will shut down, and all the carbon will be stripped from the atmosphere. As the temperatures will grow hotter, evolution will start in reverse. The larger and complex life forms will die off first, then the plants, invertebrates and eventually microbial life. If before that time, humans would develop newer technologies, it may possible for us to find a more habitable environment on another planet or moon to colonize. As the Solar System gets hotter, the other frozen planets may grow warm enough to have a sustainable environment. Hence, Mars is a likely substitute for Earth, as are some moons of other planets, such as Europa and Titan. Still, according to a new study conducted by Raphael Bousso and other physicists at University of California, Berkeley and PALS, there is a 50% chance that the entire universe will end within the next 3.7 billion years. This is before the Sun is expected to burn out. At least Bousso believes that we will not see the end of the universe coming and that it will all be over in a blink of an eye.